Music from the time of the Magna Charta, songs from the Buxheim Codex, and the latest from the amazing Greek ensemble Ex Silentio. 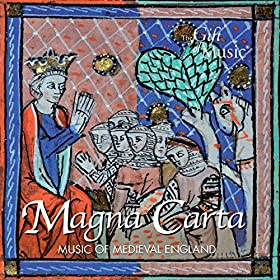 I. Magna Carta (Alamire & Magdala Ensembles/David Skinner). Gift of Music CD CDG1283. King John's signing of Magna Carta in 1215 marked a turning point in English history. The manuscript has also become a symbol of democratic liberty and law, paving the way for later celebrated documents of international significance, such as the Declaration of Independence and the Bill of Rights. Magna Carta was the first charter imposed upon a king of England by a group of subjects, in this case the feudal barons, in an attempt to limit his powers by law and to protect their own rights. Magna Carta was revolutionary because it put into writing the wishes of a group of people who turned their claim to rights into a legal reality by compelling the King to sign his name to their charter. Medieval England was a place in which writing was not a commonplace form of communication; literacy levels were low, writing materials were expensive and creating manuscripts was a long and painstaking process. Therefore, to make a king swear an oath in writing constituted a significant victory for his subjects. The rarity of written manuscripts means that there are few documented examples of medieval music from the early thirteenth century and much music thrived in an oral tradition. One of the most famous manuscripts of medieval music is the Trinity Carol Roll. One of its carols refers to events of 1415, so it cannot have been written before that year. However, many of the songs recorded in the manuscript are evidently penned from a long tradition, which has its roots in a much earlier era of music-making. The manuscript is physically striking, consisting of a roll of parchment 18 centimetres wide and two metres long. Such rolls were portable and economical to produce, but their lack of binding makes them, much like Magna Carta, vulnerable to damage. Although the word is now generally associated with Christmas, a medieval carol could be sung at any time of year and always took a specific form: a number of metrical stanzas alternated with a repeating refrain or 'burden'. Although the musical notation for many carols has been lost, some texts are annotated with names of traditional tunes to which the poem could be sung, suggesting the strong oral tradition behind the final written forms of this music. Many of these carols would have been sung in a sacred setting. They are full of praise for the Virgin Mary and for Christ, and contain strikingly vivid imagery. The disc begins 'Ther is no rose of swych vertu / As is the rose that bar Jesu. Alleluya!' In these performances, great care is taken over authentic medieval pronunciation, bringing out the true spirit of these carols. This disc also contains a series of pieces of plainchant, which would have been heard throughout early medieval Europe and in England. One of the greatest glories of the medieval Christian Church, plainchant is the musical equivalent of the sequences of Gothic arches of the cathedrals of Northern France, or the beautiful ornamentation of an otherwise plain façade of an Italian church or Spanish monastery. The medieval Church was built around a highly organised pattern of worship, with different prayers and bible readings for each time of the day. This schedule of worship was developed into the liturgy, centring on the Mass. Plainchant came about as a musical way of expressing this liturgy. This selection of calm and meditative plainchant includes an entire Mass and several psalm chants. It also features work by Abbess Hildegarde of Bingen, who was active in the twelfth century, and whose works would have been heard in medieval England. II. Mneme (Ex Silentio). Carpe Diem CD 16306. “Mneme” by the Greek early music ensemble “Ex Silentio” is an intriguing collection of musical remembrances from all around the mediterranean sea: dances, songs and instrumental pieces from medieval and early renaissance sources. The musicians of Ex Silentio, being at home both in the traditional folk music and the “classical” early music world, create a colorful portrait of these ancient times, telling of mighty kings, noble knights and beautiful princesses that once populated those countries as well as people’s imaginations then as now. “Mneme” is as much a historically well-informed performance of this ancient music as it is a visionary and highly creative fairytale derived from Greek mythology and mediterranean psyche. III. 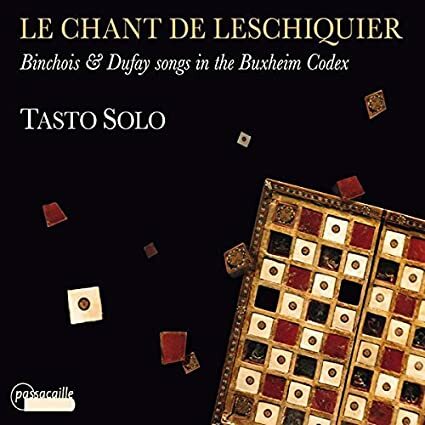 Le Chant de Leschiquier: Binchois & Dufay songs in the Buxheim Codex (Tasto Solo). Passacaille CD 1012. This Chansonnier, which is how Tasto Solo and Guilleromo Pérez imagine this CD, offers a selection of most extraordinary ballades and rondeaux by Binchois and Dufay, in addition to compositions by Ciconia and Dunstable - the two great precursors of the so-called Franco-Flemish style - and other, perhaps less well-known though inspired composers such as Bruolo and Bedyngham. The acclaimed ensemble Tasto Solo claims and re-discovers virtuosic and highly refined musical repertoires from the 14th-15th c. where gothic keyboard instruments became the cornerstone. ALFONSO X el Sabio, Saltarello - Trotto, Gherardello Da FIRENZE, Ghaetta, Raimbaut De VAQUEIRAS, J. Ciconia, G. Binchois, Bde. Bruolo, G. Dufay, J. Bedyngham, Buxheimer MS, J. Dunstaple. CD CDG1283, CD 16306, CD 1012.